I'd spent a beautiful spring day on the long weekend in my apartment, and dreaded returning to work on Monday to be asked "What did you do with your weekend?". Well, Monday rolled around and although I needed a cup of coffee to get my @ss in gear, I the bike rolled out of the garage and down the road to the local Tim Hortons where I met up with Haldane on his 1999 Honda VFR who was waiting on some the Rde Isle Riders who were going out for an afternoon run. What the heck? I've been a member of the group since last year and had yet to put in an appearance, so I asked if I could tag along, and away we went. Charlottetown PE to Souris PE to East Point Lighthouse to St. Peters PE to Charlottetown. I think we talked more than we rode, but that was okay with me, as I'm not quite up to a twelve hour day in the saddle just yet. 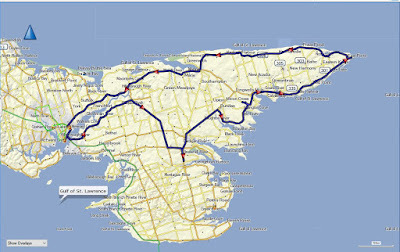 It took us a little over 5 hours to ride 250 km today. Lots of stops and I had two cups of coffee and a cup of tea to keep going. The boys are due back home and have to fly. Our glorious leader for the afternoon. Farm equipment has right of way when it comes to bikes. And she gets us all back to C Town in one piece! Thanks for letting me tag along! Have a blast out there, and remember, shiny side up!